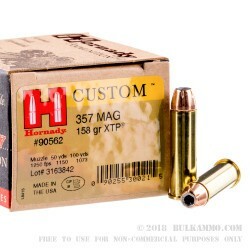 Hornady .357 Magnum 158 grain jacketed hollow point extreme terminal performance. Wow! That’s a mouthful and a gun full! You couldn’t ask for a better personal defense round. These hollow point XTP® rounds are exceptionally accurate and deliver excellent versatility and superior ballistic performance shot after shot. Each of Hornady’s rounds are loaded to ensure optimal velocity, consistency and pressures. Primers and powders are matched and selected for their ability to reliable ignite quickly and completely. They expand to 1.5x their original diameter for large and deep penetration. 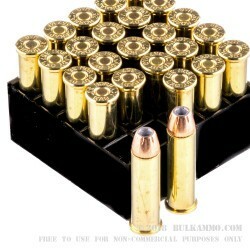 With a muzzle velocity of 1,250 fps and muzzle energy of 548 ft/lbs, these rounds will stop anything coming your way. Perfect for personal defense in your .357 Magnum carry! Based in Grand Island, Nebraska, Hornady was founded in 1949 by Joyce Hornady. In the early 1940’s Joyce Hornady teamed up with Vernon Speer making bullet jackets from spent brass rimfire casings. After the war, Hornady bought surplus manufacturing equipment from the government which are still used today! 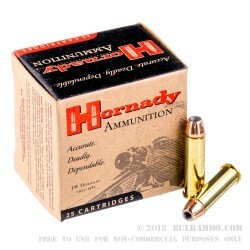 Hornady began manufacturing rifle and pistol ammunition in 1964. Joyce Hornady perished in a plane crash in 1981 and the business is now currently owned by Joyce’s son, Steve. Hornady ammunition is built for peak performance. 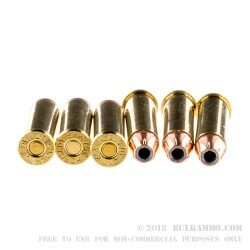 It is all new production, non-corrosive, boxer primed and have reloadable brass casings.